This entry was posted in 1 Beekeeping and tagged beehives, bees, burlap, hives, insualtion, top bars, topbars, Winter, wrapping. Bookmark the permalink. This is a great tip particularly to those fresh to the blogosphere. Simple but very accurate information… Appreciate your sharing this one. A must read post! thank you for your kind words. we can all learn from each other, no matter how long we’ve been beekeeping. 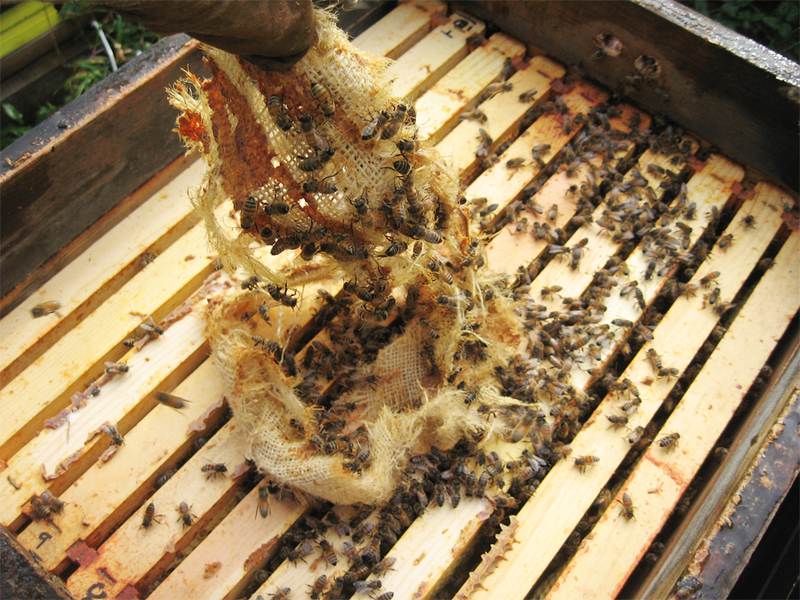 A novice can come up with a new idea and/or new observation that has been forgotten or overlooked by more “experienced” beekeepers. I too worry about what the insulation is made of…but I figure that unless I’m going to use wool I’m stuck with man-made products (Wool works really well, but here, the mice would love it way too much and I think wool would absorb a lot of water and create its own problems). I think as long as there is air flow around the insulation the worst of whatever insulation vents should not hurt the bees. After all bees have been known to live for years inside the walls of houses – lots of insulation there. I don’t put anything under the hive. In fact, all my hives are on open screens all year. But mine sit about 6-8 inches off the ground. There’s not a lot of air flow down there, especially when the snow covers the hives – the snows a good insulation in itself. How does your below the bottom board insulation hold up to the weather? Does a hive need a top Exit & why ? & where ? & how big ? Jim-Hope this gets to you, my computers being odd. When it goes right I might try again. If you ask 5 different beekeepers how to do something you’ll come up with at least 7 different answers. 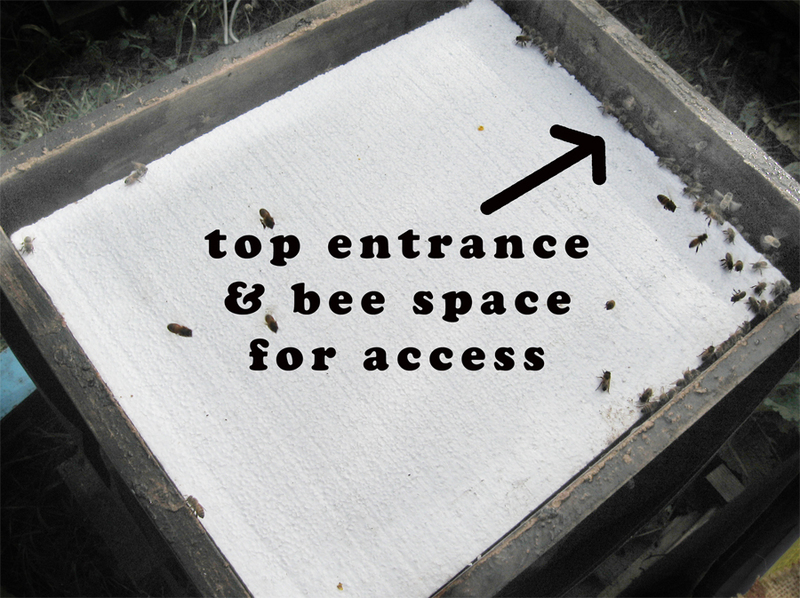 So this is just my humble opinion: All hives should have an upper entrance. This should be on the same side as the main entrance. Why: The bees seem to like it. Some hives will use it, others will ignore it. If you get snow in the winter, it may be the only entrance they have on sunny days. It helps ventilation (that’s why on the same side as the entrance, you don’t want to make a cross draft though the hive). Everyone seem to have a different size. I think mine are 1/4″ (or is it 7/32 – huge difference, eh?) I used to make mine the size of a wine cork. I then found that mice can get though that size real easy. So I do 2 holes 1/4″ish holes side by side. Big enough for bees. To small for Mice. Easy to guard againse wasps. As I said, others make them larger. One note: the tops really do need some ventilation. I use popsicle sticks glued to the underside of the top to give a 1/8″ opening to let the hive vent humid air. 1/8″ is considered too small for a bee to go though. Hope that helps.